Silver Point, which is formed by Silver Crag, is a promontory separating the upper and middle reaches of Ullswater Lake. Silver Crag at 890ft is an outlier standing apart from the mass of Place Fell. From the White Lion Inn follow the road past the Patterdale Hotel on the left and the Pay and Display car park on the right. Immediately after the school we turn right sign posted Boredale and Howtown. We follow the track over the bridge to Side Farm. We then turn left and keep heading forwards following the track past the camp site until we reach the headland at Silver Point. The track now turns right then bears left. After a short way we turn right uphill on the stone steps. We go over the brow and keep heading forwards following the track. We pass a seat and start to go downhill. As we pass through some quarry workings and look to the right we can see Side Farm down below. We keep heading forwards then take the track on the right downhill into the village of Rooking where we turn left and follow the small road crossing over the bridge back to our parked car. 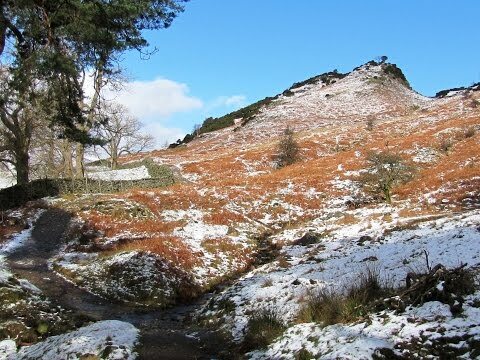 This is an easy walk on good paths and tracks with one easy to moderate incline at Silver Crag. A great family walk. Approx 3.1 miles allow 2 hours using OS Explorer Map OL5, The English Lakes North-eastern area. Start point: The free lay-by opposite the White Lion Inn pub. From the A66 at Troutbeck take the A5091 sign posted Ullswater. Follow the A5091 until it joins the A592, on the edge of Ullswater, turn right and Patterdale is less than a mile further on from Glenridding. Parking: Pay and display car park opposite the Patterdale Hotel £4.50 for all day. There is also a few free road side parking places opposite the White Lion Inn.